My loving mother, Gloria Ann Evans, left this world on December 6, 2018 at the age of 92, at home in Las Vegas. Gloria was born in Mt. Clemons, Michigan on October 12, 1926. She is preceded in death by her loving and fun loving husband Ralph Evans. In 1961 the family migrated to California with many other GM/Delco families when they opened a facility in Goleta. They shared many happy times with Delco families in Goleta in the La Patera area, and were founding members of The Danceros, a dance club that had quite a few members. Gloria was past President of the Goleta Boys Club Auxillary, and was instrumental in bringing Joan Crawford to Goleta for the grand opening of the Cinema Theater, for a benefit for the Goleta Boys Club. Gloria had a lifelong passion for home decorating, and therefore, the family was often moving to new homes when a complete home redecoration was completed. Gloria was a long time office manager at North American Weather Consultants (NAWC) , and stayed with them to their move to Salt Lake City. After the birth of their grandson Joel, they returned to the Santa Barbara area where Gloria worked at Raytheon for a number of years before retiring and relocating to Las Vegas. Gloria was a beautiful and talented woman. She loved to shop, decorate, and laugh! She was a master seamstress, excelled at needlepoint, crocheting and any other craft she found interesting. She always had several projects in progress, even until the end. She spent many happy times with her circle of friends in Las Vegas, playing bingo and bunco. 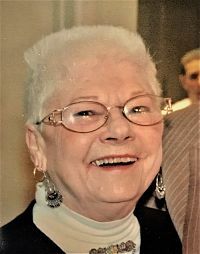 Gloria leaves behind her sons, Robin Evans (wife Maureen) of Santa Barbara and Scott Evans of Las Vegas, and her grandson, Joel Evans of Santa Barbara. The family would like to offer a special thank you to Sharon and Don Miller, Gloria’s neighbors, who were of a great help to Gloria in her final moments and days. They are truly angels among us. Also a special thanks to her Hospice nurses and aides. A private celebration was held at her home with her loving friends. We will miss you Mom!